Recognized as one of the most prominent record producers of the '80s and having worked with the likes of Brian Eno, U2 and Peter Gabriel, one could surmise that Daniel Lanois is an artist that needs little introduction. The local radio host who made one before Lanois' Supercrawl-closing set promised his arrival onstage any moment when the man was in fact right behind him, looking more like a roadie than the main attraction in his dark denim vest, pulled down trucker cap and large sunglasses. Brushing it off with a laugh, Lanois got to work by filling the first 45 minutes of the set with lengthy avant-garde pieces played from a small rig of synthesizers, filtered and modulated beyond belief. 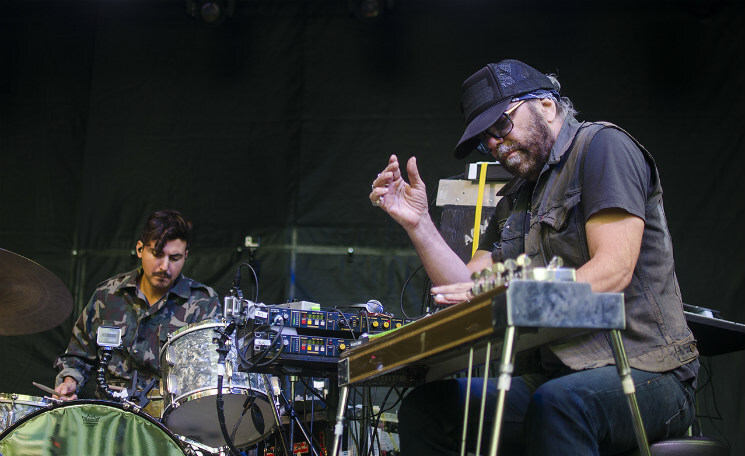 Accompanied by a talented rhythm section of drummer Kyle Crane and bassist Jim Wilson, Lanois would then move to his pedal steel to solo alongside them, playing the instrument with enough force to make it shake on its stand. In taking a break from his electronics, Lanois picked up his iconic gold Gibson Les Paul to play "The Maker" from his celebrated Acadie, tacking on a heavily extended jam to the end. He dedicated a run-through of "I Love You" to his mother, who was sitting side stage, even stopping the show to thank her, his bandmates and many others — he thanked the crowd, particularly, for their warm reception to his "electronic inventions." "We're moving into the future in the laboratory these days," he joked. In what couldn't have been a more fitting end to the festival, Lanois treated the crowd to an excellently phrased pedal steel solo in C Major while the sun burst through the clouds above the Hamilton skyline for the first time all weekend.